Brian Harold May, CBE (born 19 July 1947) is an English musician, singer, songwriter, and astrophysicist. He is best known as the lead guitarist of the rock band Queen. He uses a home-built electric guitar called the Red Special. His compositions for the band include "We Will Rock You", "Tie Your Mother Down", "I Want It All", "Fat Bottomed Girls", "Flash", "Hammer to Fall", "Save Me", "Who Wants to Live Forever", and "The Show Must Go On". May was a co-founder of Queen with lead singer Freddie Mercury and drummer Roger Taylor, having previously performed with Taylor in the band Smile, which he had joined while he was at university. Within five years of their formation in 1970 and the recruitment of bass player John Deacon completing the lineup, Queen had become one of the biggest rock bands in the world with the success of the album A Night at the Opera and its single "Bohemian Rhapsody". From the mid-1970s until the early 1990s, Queen were an almost constant presence in the UK charts and played some of the biggest venues in the world, most notably giving an acclaimed performance at Live Aid in 1985. As a member of Queen, May became regarded as a virtuoso musician and he was identified with a distinctive sound created through his layered guitar work. This article is about the British astrophysicist and guitarist-musician member of Queen. For the Australian film composer, see Brian May (Australian composer). Not to be confused with Brian Mayes. Brian Harold May, CBE (born 19 July 1947) is an English musician, singer, songwriter, and astrophysicist. He is best known as the lead guitarist of the rock band Queen. He uses a home-built electric guitar called the Red Special. His compositions for the band include "We Will Rock You", "Tie Your Mother Down", "I Want It All", "Fat Bottomed Girls", "Flash", "Hammer to Fall", "Save Me", "Who Wants to Live Forever", and "The Show Must Go On". May was a co-founder of Queen with lead singer Freddie Mercury and drummer Roger Taylor, having previously performed with Taylor in the band Smile, which he had joined while he was at university. Within five years of their formation in 1970 and the recruitment of bass player John Deacon completing the lineup, Queen had become one of the biggest rock bands in the world with the success of the album A Night at the Opera and its single "Bohemian Rhapsody". From the mid-1970s until the early 1990s, Queen were an almost constant presence in the UK charts and played some of the biggest venues in the world, most notably giving an acclaimed performance at Live Aid in 1985. As a member of Queen, May became regarded as a virtuoso musician and he was identified with a distinctive sound created through his layered guitar work. Following the death of Mercury in 1991, Queen were put on hiatus for several years but were eventually reconvened by May and Taylor for further performances featuring other vocalists. In 2005, a Planet Rock poll saw May voted the seventh greatest guitarist of all time. He was ranked at No. 26 on Rolling Stone's list of the "100 Greatest Guitarists of All Time". In 2012, he was ranked the second greatest guitarist in a Guitar World magazine readers poll. In 2001, he was inducted into the Rock and Roll Hall of Fame as one of the band's members, and in 2018 he received the Grammy Lifetime Achievement Award which recognises "the most distinctive recordings in music history". May was appointed a CBE by Queen Elizabeth II in 2005 for "services to the music industry and for charity work". May earned a PhD in astrophysics from Imperial College London in 2007, and was Chancellor of Liverpool John Moores University from 2008 to 2013. He was a "science team collaborator" with NASA's New Horizons Pluto mission. He is also a co-founder of the awareness campaign Asteroid Day. Asteroid 52665 Brianmay was named after him. May is also an animal rights activist, campaigning against the hunting of foxes and the culling of badgers in the UK. Brian Harold May was born on 19 July 1947 in Hampton, Middlesex, the only child of Ruth Irving (Fletcher) and Harold May, who worked as a draughtsman at the Ministry of Aviation. His mother was Scottish, while his father was English. May attended the local Hampton Grammar School, then a voluntary aided school. During this time, he formed his first band, named 1984 after George Orwell's novel of the same name, with vocalist and bassist Tim Staffell. At Hampton Grammar School, he attained ten GCE Ordinary Levels and three GCE Advanced Levels in Physics, Mathematics, and Applied Mathematics. He studied Mathematics and Physics at Imperial College London, graduating with a Bachelor of Science degree in Physics in 1968 with honours. In 2007, May was awarded a PhD in astrophysics from Imperial College London for work started in 1971 and completed in 2007. May formed the band Smile in 1968. The group included Tim Staffell as the lead singer and bassist, and later, drummer Roger Taylor, who also went on to play for Queen. The band lasted for only two years, from 1968 to 1970, as Staffell departed in 1970, leaving the band with a catalogue of nine songs. Smile would reunite for several songs on 22 December 1992. Taylor's band The Cross were headliners, and he brought May and Staffell on to play "Earth" and "If I Were a Carpenter". May also performed several other songs that night. In Queen's three-part vocal harmonies, May was generally the lower-range backing vocalist. On some of his songs, he sings the lead vocals, most notably the first verse of "Who Wants to Live Forever", the final verse of "Mother Love", the middle eight on "I Want It All" and "Flash's Theme", and full lead vocals on "Some Day One Day", "She Makes Me (Stormtrooper in Stilettoes)", "'39", "Good Company", "Long Away", "All Dead, All Dead", "Sleeping on the Sidewalk", "Leaving Home Ain't Easy". May frequently wrote songs for the band and has composed many hits such as "We Will Rock You", "Tie Your Mother Down", "I Want It All", "Fat Bottomed Girls", "Who Wants to Live Forever" and "The Show Must Go On" as well as "Hammer to Fall", "Flash", "Now I'm Here", "Brighton Rock", "The Prophet's Song", "Las Palabras de Amor", "No-One but You (Only the Good Die Young)" and "Save Me". After the Live Aid concert in 1985, Mercury rang his band members and proposed writing a song together. The result was "One Vision", which was basically May on music (the Magic Years documentary shows how he came up with the opening section and the basic guitar riff) and the lyrics were co-written by all four band members. For their 1989 release album, The Miracle, the band had decided that all of the tracks would be credited to the entire band, no matter who had been the main writer. Still, interviews and musical analyses tend to help identify the input of each member on each track. May composed "I Want It All" for that album, as well as "Scandal" (based on his personal problems with the British press). For the rest of the album he did not contribute so much creatively, although he helped in building the basis of "Party" and "Was It All Worth It" (both being predominantly Mercury's pieces) and created the guitar riff of "Chinese Torture". Queen's subsequent album was Innuendo, on which May's contributions increased, although more in arrangements than actual writing in most cases; for the title track he did some of the arrangement for the heavy solo, then he added vocal harmonies to "I'm Going Slightly Mad" and composed the solo of "These Are the Days of Our Lives", a song for which the four of them decided the keyboard parts together. Two songs that May had composed for his first solo album, "Headlong" and "I Can't Live With You", eventually ended up in the Queen project. His other composition was "The Show Must Go On", a group effort in which he was the coordinator and primary composer. In recent years, he has supervised the remastering of Queen albums and various DVD and greatest hits releases. In 2004, he announced that he and drummer Roger Taylor were going on tour for the first time in 18 years as "Queen", along with Free/Bad Company vocalist Paul Rodgers. Billed as "Queen + Paul Rodgers", the band played throughout 2005 and 2006 in South Africa, Europe, Aruba, Japan, and North America and released a new album with Paul Rodgers in 2008, entitled The Cosmos Rocks. This album was supported by a major tour. Paul Rodgers then left the band  in May 2009 and it wasn't until 2011 that another vocalist, Adam Lambert, was recruited. They subsequently went on a 2012 European Tour, a world tour over 2014 and 2015 and, most recently, 2016 Festival Tour. They also played the Big Ben New Year concert on New Year's Eve 2014 and New Year's Day 2015. During 1983, several members of Queen explored side projects. On 21 and 22 April in Los Angeles, May was in the studio with Eddie Van Halen, with no intentions of recording anything; the result of those days was a mini album entitled Star Fleet Project, which originally wasn't going to be released. May contributed to former Genesis guitarist Steve Hackett's album Feedback 86, playing guitar on the track "Cassandra" and providing guitar and vocals for "Slot Machine," which was co-written by May. Although produced in 1986, the album was not issued as a commercial release until 2000. May worked with his second wife Anita Dobson on her first album, in which she sang vocals to the EastEnders theme tune. In this form, the tune became the song "Anyone Can Fall in Love". May produced the song, which reached No. 4 in the UK Singles Chart in August 1986. In 1989, May contributed guitar solos to the song "When Death Calls" on Black Sabbath's 14th album Headless Cross, and the Living in a Box track "Blow The House Down" from the album Gatecrashing. In the aftermath of the November 1991 death of Mercury, May chose to deal with his grief by committing himself as fully as possible to work, first by finishing his solo album, Back to the Light, and then touring worldwide to promote it. He frequently remarked in press interviews that this was the only form of self-prescribed therapy he could think of. According to Def Leppard lead singer Joe Elliott, "It was undoubtedly an enormous and terrible blow to lose someone he was so close to. Personally, I know it ripped the heart out of Brian, but having said that, he was in great spirits after the album was finished." In late 1992, the Brian May Band was officially formed. An earlier version of the band was loosely formed for 19 October 1991, the date of the band's last concert of reunion, when May took part in the Guitar Legends guitar festival in Seville, Spain. The line-up for his performance was May on vocals and lead guitar, Cozy Powell on drums and percussion, Mike Moran and Rick Wakeman on keyboards, and Maggie Ryder, Miriam Stockley and Chris Thompson on backing vocals. The original line-up was May on vocals and lead guitar, Powell on drums and percussion, Michael Casswell on guitar, Neil Murray on bass, and Ryder, Stockley and Thompson on backing vocals. This version of the band lasted only during the South American support tour (supporting The B-52's and Joe Cocker) on only five dates. Afterwards, May made significant changes, feeling the group never quite gelled. May brought guitarist Jamie Moses on board to replace Mike Caswell. The other change made was in the backing vocals department, when Ryder, Stockley and Thompson were replaced with Catherine Porter and Shelley Preston. On 23 February 1993, this new line-up of The Brian May Band began its world tour in the US, both supporting Guns N' Roses and headlining a few dates. The tour would take them through North America, Europe (support act: Valentine) and Japan. After the tour ended on 18 December 1993, May returned to the studio with fellow surviving Queen band members Roger Taylor and John Deacon to work on tracks that became Made in Heaven, the final Queen studio album. The band took Mercury's solo album demos and last recordings, which he managed to perform in the studio after the album Innuendo was finished, and completed them with their additions both musically and vocally. Work on the album after Mercury's death originally began in 1992 by Deacon and May, but was left until a later date, due to other commitments. In 1995, May began working towards a new solo album of covers tentatively named Heroes, in addition to working on various film and television projects and other collaborations. May subsequently changed the approach from covers to focus on those collaborations and on new material. The songs included Another World, and featured mainly Spike Edney, Cozy Powell, Neil Murray and Jamie Moses. On 5 April 1998, Cozy Powell was killed in a car accident on the M4 motorway near Bristol, England. This caused a huge, unexpected disruption to the upcoming tour for The Brian May Band, with a new drummer being needed at short notice. Steve Ferrone was brought on to help May finish recording drums and to join the band for the early stage promotional tour of five dates in Europe before the world tour. Following the early promotional tour, Eric Singer replaced Steve Ferrone for the full 1998 world tour. The 1998 tour saw the brief introduction of a 'support act' known as T. E. Conway. Conway (Brian May in a wig and colourful suit playing the part of a teddy boy crooner) would play a number of 1950s rock and roll standards prior to May's 'arrival'. A bonus T. E. Conway EP entitled Retro Rock Special was attached to some pressings of the Another World album. The Conway character was retired at the end of the tour. In May 1999, May recorded lead guitars for the Guns N' Roses song "Catcher in the Rye" on Chinese Democracy, however his performance was removed from the album by the time it was released in 2008. From his last solo release in 1998, May has been performing as a solo artist, as part of an ensemble, and infrequently as Queen with Roger Taylor. On 22 October 2000, he made a guest appearance at the Motörhead 25th Anniversary show at Brixton Academy along with Eddie Clarke (former Motörhead guitarist) for the encore song "Overkill". As part of the Golden Jubilee of Elizabeth II celebrations on 3 June 2002, May performed a guitar solo of "God Save the Queen" from the roof of Buckingham Palace, with the performance appearing on the 30th Anniversary DVD edition of A Night at the Opera. In 2004, May played guitar on the song "Someone to Die For" on the Spider-Man 2 soundtrack. In the Queen's birthday honours list of 2005, he was made a Commander of the Most Excellent Order of the British Empire "for services to the music industry and for charity work". In the same year he played the guitar in the song Il mare... of the Italian singer Zucchero Fornaciari, in his album Zu & Co., and he took part in the concert at the Royal Albert Hall in London held in May 2004, with the other guests of the Italian bluesman. May was a celebrity guest at the Genesis reunion concert at Twickenham Stadium in 2007. May and Genesis frontman Phil Collins had worked together on two previous occasions, at The Prince's Trust Rock Gala in 1988 and the Party at the Palace in 2002, when Collins had played drums with Queen. In 2011 he contributed to a feature about Collins for FHM, praising him as "a great guy and an amazing drummer". May worked extensively with stage actress and singer Kerry Ellis, after he cast her in the musical We Will Rock You. He produced and arranged her debut studio album Anthems (2010), a follow-up to her extended play Wicked in Rock (2008), as well as appearing with Ellis at many public performances – playing guitar alongside her. He also contributed a guitar solo to Meat Loaf's Hang Cool, Teddy Bear album in exchange for the use of drummer John Miceli. Along with Elena Vidal, Brian May released a historical book in 2009 entitled A Village Lost and Found: Scenes in Our Village. The book is an annotated collection of stereoscopic photographs taken by the Victorian era photographer T. R. Williams and it is sold with a focussing stereoscope. May became an enthusiast of stereoscope photographs as a child, and first encountered the work of Williams during the late 1960s. In 2003, May announced a search to identify the actual location of the Scenes in Our Village images. In 2004 May reported that he had identified the location as the village of Hinton Waldrist in Oxfordshire. On 20 May 2009, May and Queen bandmate Roger Taylor performed "We Are the Champions" live on the season finale of American Idol with winner Kris Allen and runner-up Adam Lambert providing a vocal duet. In November 2009, May appeared with Taylor on The X Factor, with Queen mentoring the contestants, then later performing "Bohemian Rhapsody". In April 2010, May founded the "Save Me" 2010 project to work against any proposed repeal of the British fox-hunting ban, and also to promote animal rights in Britain. In February 2011, it was announced that May would tour with Kerry Ellis, playing 12 dates across the UK in May 2011. On 18 April 2011, Lady Gaga confirmed that May would play guitar on her track "You and I" from her latest album Born This Way, released on 23 May 2011. May joined Gaga on stage during the performance of "You and I" at the 2011 MTV Video Music Awards held at Nokia Theatre in Los Angeles. In June 2011, May performed with Tangerine Dream at the Starmus Festival on Tenerife, celebrating the 50th anniversary of Yuri Gagarin's first spaceflight. On 26 August, May performed "We Will Rock You" and "Welcome to the Black Parade" with rock band My Chemical Romance at the Reading Festival. On 10 October, May made an appearance to celebrate the reunion of rock band The Darkness at an "intimate" 100 Club show with support from Dark Stares. A long-time fan of the group, May performed three songs onstage with The Darkness, including Queen's "Tie Your Mother Down", at the Hammersmith Apollo on their subsequent "comeback" tour. At the 2011 MTV Europe Music Awards on 6 November, Queen received the Global Icon Award, which Katy Perry presented to Brian May. Queen closed the awards ceremony, with Adam Lambert on vocals, performing "The Show Must Go On", "We Will Rock You" and "We Are the Champions". The collaboration garnered a positive response from both fans and critics, resulting in speculation about future projects together. Queen + Adam Lambert played two shows at the Hammersmith Apollo, London on 11 and 12 July 2012. Both shows sold out within 24 hours of tickets going on open sale. A third London date was added for 14 July. On 30 June, Queen + Lambert performed in Kiev, Ukraine at a joint concert with Elton John for the Elena Pinchuk ANTIAIDS Foundation. Queen also performed with Lambert on 3 July 2012 at Moscow's Olympic Stadium, and on 7 July 2012 at the Municipal Stadium in Wroclaw, Poland. In January 2012, May featured on N-Dubz frontman Dappy's solo single "Rockstar", providing "rumbling guitar riffs which culminate in an electrifying solo". The pair also collaborated on a performance of "We Will Rock You" for BBC Radio 1's Live Lounge. On 12 August 2012, Queen performed at the closing ceremony of the 2012 Summer Olympics in London. May performed part of the "Brighton Rock" solo before being joined by Taylor and solo artist Jessie J for a performance of "We Will Rock You". On 16 September 2012, May appeared at the Sunflower Jam charity concert at the Royal Albert Hall, performing alongside bassist John Paul Jones (of Led Zeppelin), drummer Ian Paice (of Deep Purple), and vocalists Bruce Dickinson (of Iron Maiden) and Alice Cooper. May donated his guitar talent to the end credits song from the film, A Dog Named Gucci, in the song "One Voice", which also features the talents of Norah Jones, Aimee Mann, Susanna Hoffs, Lydia Loveless, Neko Case, and Kathryn Calder. It was produced by Dean Falcone, who also wrote the film's score. "One Voice" was released on Record Store Day, 16 April 2016, with profits from the sale of the single going to benefit animal charities. 2005 Queen + Paul Rodgers Tour. At the end of 2004, May and Taylor announced that they would reunite and return to touring in 2005, with Paul Rodgers (founder and former lead singer of Free and Bad Company). Brian May's website also stated that Rodgers would be "featured with" Queen as Queen + Paul Rodgers, not replacing the late Freddie Mercury. The retired John Deacon would not be participating. 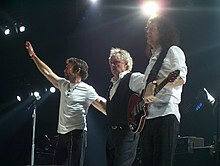 Between 2005 and 2006 Queen and Paul Rodgers embarked on a world tour, the first leg being Europe and the second, Japan and the US in 2006. On 25 May 2006, Queen received the inaugural VH1 Rock Honors at the Mandalay Bay Events Center in Las Vegas, Nevada, and May and Taylor were joined on stage with the Foo Fighters to perform a selection of Queen songs. On 15 August 2006, May confirmed through his website and fan club that Queen + Paul Rodgers would begin producing their first studio album beginning in October, to be recorded at a "secret location". The album, titled The Cosmos Rocks, was released in Europe on 12 September 2008 and in the United States on 28 October 2008. Following the album the band again embarked on a tour through Europe and parts of the US, opening on Kharkiv's freedom square in front of 350,000 Ukrainian fans. The show in Ukraine was later released on DVD. Queen and Paul Rodgers officially split up on 12 May 2009. Rodgers does not rule out the possibility of working together again. Not long after performing with American Idol finalists Kris Allen and Adam Lambert during the programme's season finale in 2009, May and Taylor began contemplating the future of Queen after the group's amicable split with frontman Paul Rodgers. Two years later, at the 2011 MTV Europe Music Awards, Queen was presented that year's Global Icon Award, accepted by May. As part of the broadcast, Queen performed a short set with Lambert, receiving an overwhelmingly welcoming response. Speculation regarding a collaboration with Lambert soon arose, with the three formally announcing a short summer tour of Europe in 2012, including three dates at the Hammersmith Apollo in London, as well as shows in Ukraine, Russia and Poland. As with the partnership with Paul Rodgers, John Deacon did not participate. The collaboration was revived in 2013, when the three performed together at the iHeartRadio Music Festival at the MGM Grand Hotel & Casino in Las Vegas on 20 September. Five months later, May, Taylor and Lambert announced a 19-date summer tour of North America on Good Morning America. Due to ticket demand, five dates were soon added. In May 2014, shows in Australia and New Zealand were announced, along with festival performances in South Korea and Japan. The tour was extended to the UK and greater Europe in early 2015. The group performed together in South America in September 2015, including Queen's first performance at the Rock in Rio Festival since 1985. In 2016, the group embarked across Europe and Asia on the Queen + Adam Lambert 2016 Summer Festival Tour. This included closing the Isle of Wight Festival in England on 12 June where they performed "Who Wants to Live Forever" as a tribute to the victims of the mass shooting at a gay nightclub in Orlando, Florida earlier that day. On 12 September they performed at the Park Hayarkon in Tel-Aviv, Israel for the first time in front of 58,000 people. In September 2018 the group had a residency in the MGM Park Theater in Las Vegas. Though the collaboration remains active, there are currently no plans of recording a studio album, though the three are willing to do so in the future. I like a big neck – thick, flat and wide. I lacquered the fingerboard with Rustin's Plastic Coating. The tremolo is interesting in that the arm's made from an old bicycle saddle bag carrier, the knob at the end's off a knitting needle and the springs are valve springs from an old motorbike. He's a class act from head to toe, and it shows in his playing. I can listen to any player and pantomime their sound, but I can't do Brian May. He's just walking on higher ground. His tone immediately grabbed me. Brian has his own style and sound, so you can always tell his work. Even in 1971 he had incredible finesse, amazing fluidity. In addition to using his home-made guitar he prefers to use coins (especially a sixpence from the farewell proof set of 1970), instead of a more traditional plastic plectrum, on the basis that their rigidity gives him more control in playing. He is known to carry coins in his pockets specifically for this purpose. May's early influences were Cliff Richard and The Shadows, who he says were "the most metallic thing(s) out at the time." Many years later he gained his opportunity to play on separate occasions with both Cliff Richard and Shadows lead guitarist Hank Marvin. He has collaborated with Cliff Richard on a re-recording of the Cliff Richard and The Shadows (then known as The Drifters) 1958 hit "Move It" on the Cliff Richard duets album Two's Company which was released on 6 November 2006. May always stated that The Beatles, Led Zeppelin, the Who and Jimi Hendrix were the greatest influences on him. On 2 June 2010, on BBC Radio 2, Brian May said, "I would put Rory Gallagher way up there; he is one of the people who inspired me most." On Queen for an Hour 1989 Interview on BBC Radio 1, May listed Jimi Hendrix, Jeff Beck and Eric Clapton as his guitar heroes. In a 1991 interview for Guitar World magazine, May referred to The Who as "my inspiration", and on seeing Led Zeppelin stated, "We used to look at those guys and think, "That's the way it should be done." May told Guitarist in 2004: "I don't think anyone has epitomised riff writing better than Jimmy Page – he's one of the great brains of rock music". May was also influenced by Steve Hackett, guitarist of progressive rock band Genesis, in particular his harmony guitar solo at the end of the band's epic 1971 song "The Musical Box". While May and his father were building the Red Special, May also produced plans to build a second guitar. However, so successful was the Red Special, that May had no need to build another guitar. These plans were eventually given to guitar luthier Andrew Guyton in around 2004/05, some slight modifications were made and the guitar was built. It was named "The Spade", as the shape of the body resembled the form shown on playing cards. However the guitar also came to be known as "The Guitar That Time Forgot". Brian May (pictured in 2017) playing his custom-made Red Special. Most of May's electric guitar work live and in the studio was done on the Red Special, which he built with his father, an electronics engineer, during his teenage years. From 1975 onwards, he has also had some replicas made, some of which were also used for live and recording purposes, others being mainly spares. The most famous replicas were made by John Birch in 1975 (May actually smashed it during a concert in the States in 1982), Greco BM90 (featured in the promo video of "Good Old-Fashioned Lover Boy" in 1977), Guild (back-up from 1984 to 1993), Fryers (1997–1998, used both live and in the studio) and Guyton (back-up from 2003 to present). On stage, May used to carry at least one back-up guitar (in case he broke a string) and occasionally would use others for certain songs or parts, such as alternate tunings. Currently, May owns a company which makes guitars whose design is modelled after the original Red Special guitar. October 1974 – May 1975: Gibson Les Paul Deluxe, and the Stratocaster from the previous tour. November 1975 – May 1976: Same two guitars as before, plus a natural finish John Birch replica of the Red Special. September 1976: Same three as before, plus a Martin D-18 acoustic for "'39". January 1977 – August 1979: Just the Birch replica plus an Ovation Pacemaker 12-string acoustic on some numbers ("'39", "Love of My Life", "Dreamer's Ball"). November 1979 – June 1982: Birch replica (back-up), Fender Telecaster ("Crazy Little Thing Called Love" 2nd verse, middle-eight and solo), Ovation (acoustic numbers). July – November 1982: Added a Gibson Flying V as second back-up. On 9 August 1982 May smashed the Birch guitar, so the Flying V became the only spare. August – October 1984: The Flying V became a second back-up again as his main spare was the Guild replica. He also used Roger Taylor's Gibson Chet-Atkins Classical Electric. July 1985 – August 1986: Gibson Flying V no longer used. The rest remained the same. In 2012 he received a double-neck replica of the Red Special with the second neck having 12-strings. He used this guitar at a few gigs with Adam Lambert now being able to play the 12-string part from the studio version of "Under Pressure" live. Burns Double Six on "Long Away" (1976) and "Under Pressure" (1981). Fender Telecaster on "Crazy Little Thing Called Love" (1979). It was used for the video (but not the recordings) of "Back Chat" (1982). Gibson Firebird on "Hammer to Fall" and "Tear It Up" (album versions only, not on stage). Ibanez JS on "Nothing But Blue" (1991). Parker Fly on "Mother Love" (1993–1995). For acoustic, he favoured Ovation, Martin, Tōkai Hummingbird, Godin and Guild. On a couple of videos he also used some different electric guitars: a Stratocaster copy on "Play the Game" (1980) and a Washburn RR2V on "Princes of the Universe" (1986). In 1984 Guild released the first official Red Special replica for mass production, and made some prototypes specifically for May. However the solid body construction (the original RS has hollow cavities in the body) and the pick-ups (DiMarzio) that were not an exact replica of the Burns TriSonic did not make May happy, so the production stopped after just 300 guitars. In 1993 Guild made a second replica of the RS, made in just 1000 copies, of which May has some and used as a back-up. At the moment, he uses the two guitars made by Greg Fryer—the luthier who restored the Old Lady in 1998—as back-up. They are almost identical to the original, except for the Fryer logo on the headstock (May's original one has a sixpence). 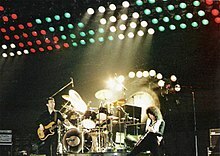 In the studio, May used Yamaha DX7 synths for the opening sequence of "One Vision" and the backgrounds of "Who Wants to Live Forever" (also on stage), "Scandal" and "The Show Must Go On". He mostly used Freddie Mercury's 1972 Steinway piano and reportedly now owns the instrument in question. May was keen on using some toys as instruments as well. He used a Yamaha plastic piano in "Teo Torriatte" and a toy mini koto in "The Prophet's Song". He also used a "genuine George Formby Ukulele-Banjo" in "Bring Back That Leroy Brown" and "Good Company". 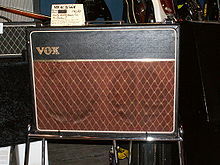 May has used Vox AC30 amplifiers almost exclusively since a meeting with his long-time hero Rory Gallagher at a gig in London during the late 1960s/early 1970s. In the mid-1970s he used six of them, with an Echoplex delay (with extended delay time) plugged into a separate amplifier, and a second Echoplex plugged into yet another amp; he used a homemade booster, his only effects pedal, which was on all the time. His choice is the model AC30TBX, the top-boost version with Blue Alnico speakers, and he runs the amp at full volume on the Normal channel. May also customises his amps by removing the circuitry for the Brilliant and Vib-trem channels (leaving only the circuitry for the Normal), and this alters the tone slightly, with a gain addition of 6–7 dB. He always used a treble booster which, along with the AC30 and his custom 'Deacy Amp' transistor amp, built by Queen bass player John Deacon, went a long way in helping to create many of his signature guitar tones. He used the Dallas Rangemaster for the first Queen albums, up to A Day at the Races. Effects guru Pete Cornish built for him the TB-83 (32 dB of gain) that was used for all the remaining Queen albums. He switched in 2000 to the Fryer's booster, which actually gives less boost than the TB-83. When performing live, he uses banks of Vox AC30 amplifiers keeping some amps with only guitar and others with all effects such as delay, flanger and chorus. He has a rack of 14 AC30s, which are grouped as Normal, Chorus, Delay 1, Delay 2. On his pedal board, May has a custom switch unit made by Cornish and subsequently modified by Fryer that allows him to choose which amps are active. He uses a BOSS pedal from the '70s, the Chorus Ensemble CE-1, which can be heard in "In The Lap of The Gods" (Live at Wembley '86) or "Hammer to Fall" (slow version played live with P. Rodgers). Next in the chain, he uses a Foxx Foot Phaser ("We Will Rock You", "We Are the Champions", "Keep Yourself Alive", etc. ), and two delay machines to play his trademark solo in "Brighton Rock". The first instrument May learned to play was the banjolele, which he played on Queen's song "Bring Back That Leroy Brown" (live and in the studio). For "Good Company", he used a regular baritone ukulele which he had bought in Hawaii on a holiday. Occasionally, May would also record on other string instruments such as harp (one chord per take, then copied and pasted by the engineer to make it sound like a continuous performance) and bass (on some demos and many songs in his solo career, and the Queen + Paul Rodgers album). As a child, he was also trained on classical piano. Although Freddie Mercury was the band's primary pianist, May would occasionally step in (such as on "Save Me", "Flash", "Who Wants to Live Forever"). From 1979 onwards, he also played synthesisers, organ ("Wedding March", "Let Me Live") and programmed drum-machines for both Queen and outside projects (such as producing other artists and his own solo records). May is also an accomplished singer. From Queen's Queen II to The Game, May contributed lead vocals to at least one song per album. May co-composed a mini-opera with Lee Holdridge, Il Colosso, for Steve Barron's 1996 film, The Adventures of Pinocchio. May performed the opera with Jerry Hadley, Sissel Kyrkjebo, and Just William. On-screen, it was performed entirely by puppets. May performing in Frankfurt in 2005. Brian May began composing in 1968 to 1969, and through the years he has collaborated with other songwriters, including Frank Musker, with whom he wrote "Too Much Love Will Kill You", and with Elizabeth Lamers, whose music won the Ivor Novello Award for Best Song Musically & Lyrically in 1996. A meticulous arranger, he focuses on multi-part harmonies, often more contrapuntal than parallel – a relative rarity for rock guitar. Examples are found in Queen's albums A Night at the Opera and A Day at the Races, where he arranged a jazz band for guitar mini-orchestra ("Good Company"), a vocal canon ("The Prophet's Song") and guitar and vocal counterpoints ("Teo Torriatte"). 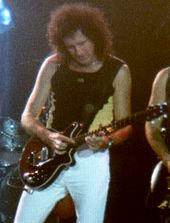 May explored a wide variety of styles in guitar, including sweep picking ("Was It All Worth It", "Chinese Torture"), tremolo ("Brighton Rock", "Stone Cold Crazy", "Death on Two Legs", "Sweet Lady", "Bohemian Rhapsody", "Get Down Make Love", "Dragon Attack"), tapping ("Bijou", "It's Late", "Resurrection", "Cyborg", "Rain Must Fall", "Business", "China Belle", "I Was Born To Love You"), slide guitar ("Drowse", "Tie Your Mother Down"), Hendrix sounding licks ("Liar", "Brighton Rock"), tape-delay ("Brighton Rock", "White Man") and melodic sequences ("Bohemian Rhapsody", "Killer Queen", "These Are the Days of Our Lives"). Some of his solos and orchestral parts were composed by Freddie Mercury, who then asked May to bring them to life ("Bicycle Race", "Lazing on a Sunday Afternoon", "Killer Queen", "Good Old Fashioned Lover Boy"). May also performed notable acoustic works, including the acoustic guitar live version of "Love of My Life" from 1975's A Night at the Opera, the finger-picked solo of "White Queen" and the skiffle-influenced "'39". In January 2007, the readers of Guitar World voted May's guitar solos "Bohemian Rhapsody", "Brighton Rock" into the "top 50 Greatest Guitar Solos of all time" ("Bohemian Rhapsody" was voted No. 20 and "Brighton Rock" was voted #41). Aided by the uniqueness of his guitar – the Red Special – May was often able to create strange and unusual sound effects. For example, he was able to imitate an orchestra in the song "Procession"; in "Get Down, Make Love" he was able to create various sound effects with his guitar; in "Good Company" he used his guitar to mimic a trombone, a piccolo and several other instruments for the song's Dixieland jazz band feel. Queen used a "No synthesizers were used on this album" sleeve note on their early albums to make this clear to the listeners. May also used his guitar to create the chime effect in Bohemian Rhapsody. May studied physics and mathematics at Imperial College London, graduating with a BSc (Hons) degree and ARCS in physics with Upper Second-Class Honours. From 1970 to 1974, he studied for a PhD degree at Imperial College, studying reflected light from interplanetary dust and the velocity of dust in the plane of the Solar System. When Queen started to have international success in 1974, he abandoned his doctoral studies, but co-authored two peer reviewed research papers, which were based on his observations at the Teide Observatory in Tenerife. In October 2006, May re-registered for his PhD at Imperial College and submitted his thesis in August 2007 (one year earlier than he estimated it would take to complete). As well as writing up the previous work he had done, May had to review the work on zodiacal dust undertaken during the intervening 33 years, which included the discovery of the zodiacal dust bands by NASA's IRAS satellite. After a viva voce, the revised thesis (titled A Survey of Radial Velocities in the Zodiacal Dust Cloud) was approved in September 2007, some 37 years after it had been commenced. He was able to submit his thesis only because of the minimal amount of research on the topic during the intervening years and has described the subject as one that became "trendy" again in the 2000s. His PhD investigated radial velocity using absorption spectroscopy and doppler spectroscopy of zodiacal light using a Fabry–Pérot interferometer based at the Teide Observatory in Tenerife. His research was initially supervised by Jim Ring, Ken Reay and in the latter stages by Michael Rowan-Robinson. He graduated at the awards ceremony of Imperial College held in the Royal Albert Hall on 14 May 2008. In October 2007, May was appointed a Visiting Researcher in Imperial College and continues his interest in astronomy and involvement with the Imperial Astrophysics Group. He is co-author, with Sir Patrick Moore and Chris Lintott, of Bang! – The Complete History of the Universe and The Cosmic Tourist. May appeared on the 700th episode of The Sky at Night hosted by Sir Patrick Moore, along with Chris Lintott, Jon Culshaw, Prof. Brian Cox, and the Astronomer Royal Martin Rees who on departing the panel, told Brian May, who was joining it, "I don't know a scientist who looks as much like Isaac Newton as you do". May was also a guest on the first episode of the third series of the BBC's Stargazing Live, on 8 January 2013. On 17 November 2007, May was appointed Chancellor of Liverpool John Moores University, and installed in 2008 having also been awarded an honorary fellowship from the University for his contribution to astronomy and services to the public understanding of science. He held the post until 2013. Asteroid 52665 Brianmay was named after him on 18 June 2008 on the suggestion of Patrick Moore (probably influenced by the asteroid's provisional designation of 1998 BM30). In 2014, May co-founded Asteroid Day with Apollo 9 astronaut Rusty Schweickart, B612 Foundation COO Danica Remy and German filmmaker Grigorij Richters. Asteroid Day is a global awareness campaign where people from around the world come together to learn about asteroids and what we can do to protect our planet. May was a guest at the 2016 Starmus Festival where he also performed on stage with composer Hans Zimmer. The theme was Beyond The Horizon: A Tribute To Stephen Hawking. During the New Horizons Pluto flyby NASA press conference held on 17 July 2015 at Johns Hopkins Applied Physics Lab, May was introduced as a science team collaborator. He told the panel "You have inspired the world." On 31 December 2018 through 1 January 2019, May was in attendance at the watch party for the New Horizons flyby of the Kuiper belt object, Ultima Thule, and performed an updated version of his New Horizons celebratory song. From 1976 to 1988, May was married to Christine Mullen, and they had three children: James (born 15 June 1978), Louisa (born 22 May 1981), and Emily Ruth (born 18 February 1987). They separated in 1988. May had met actress Anita Dobson in 1986, and she inspired him to write the 1989 hit "I Want It All". They married on 18 November 2000. He has stated in interviews that he suffered from severe depression in the late 1980s and early 1990s, to the point of contemplating suicide, for reasons having to do with his troubled first marriage, his perceived failure as a husband and a father, his father Harold's death, and Freddie Mercury's illness and death. According to The Sunday Times Rich List of 2017, May is worth £125 million. He has homes in London and Windlesham, Surrey. May's father Harold was a long-time heavy cigarette smoker. As a result, May dislikes smoking, to the point where he was already prohibiting smoking indoors at his concerts before many countries imposed smoking bans. May is a vegetarian. He is an active animal rights advocate, and was appointed a vice-president of animal welfare charity, the RSPCA, in September 2012. May describes himself as agnostic. May is a long-term champion of woodland as a haven and "corridor" for wildlife, both in Surrey, where he has a house and elsewhere. In 2012, he bought land threatened by building development at Bere Regis, Dorset and, in 2013 and with the enthusiastic support of local villagers, initiated a project to create an area of woodland, now called May's Wood (or "the Brian May Wood"). The wood consists of 157 acres, formerly under the plough, planted by May's team of co-workers with 100,000 trees. May's Wood is said to be flourishing. In September 2015, a new damselfly species of the genus Heteragrion (Odonata : Zygoptera) from Brazil was named Heteragrion brianmayi. May filming for the BBC's The One Show in 2011 for an anti–badger culling campaign. May has formed a group to promote animal welfare. Though a Conservative Party voter most of his life, he has stated that their policies on fox hunting and the culling of badgers meant he did not vote for them at the 2010 UK general election. His group, Save Me (named after the May-written Queen song), campaigns for the protection of all animals against unnecessary, cruel and degrading treatment; with a particular emphasis on preventing hunting of foxes and the culling of badgers. The group's primary concern is to ensure that the Hunting Act 2004 and other laws protecting animals are retained in situ. 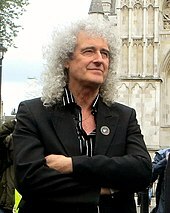 In an interview in September 2010 with Stephen Sackur for the BBC's HARDtalk program, May said that he would rather be remembered for his animal rights work than for his music or scientific work. May is a staunch supporter of the RSPCA, the International Fund for Animal Welfare, the League Against Cruel Sports, PETA UK and the Harper Asprey Wildlife Rescue. In March 2012, May contributed the foreword to a target paper published by the think tank the Bow Group, urging the government to reconsider its plans to cull thousands of badgers to control bovine TB, stating that the findings of Labour's major badger culling trials, several years earlier, show that culling does not work. The paper was authored by Graham Godwin-Pearson with contributions by leading tuberculosis scientists, including Lord Krebs. In 2013, May joined French guitar player Jean-Pierre Danel for a charity Danel launched for the benefit of animal rights in France. The guitarists signed guitars and art photos together, and were joined by Hank Marvin. In May 2013, May teamed up with actor Brian Blessed and Flash cartoonist Jonti "Weebl" Picking, as well as animal rights groups including the RSPCA, to form Team Badger, a "coalition of organisations that have teamed up to fight the planned cull of badgers". With Weebl and Blessed, May recorded a single, "Save the Badger Badger Badger" – a mashup of Weebl's viral 2003 Flash cartoon meme, "Badger Badger Badger", and Queen's "Flash", featuring vocals by Blessed. On 1 September 2013, "Save The Badger Badger Badger" charted at No. 79 on the UK Singles Chart, No. 39 on the UK iTunes chart and No. 1 on the iTunes Rock chart. In June 2013 renowned naturalist Sir David Attenborough and rock guitarist Slash joined May to form the supergroup, Artful Badger and Friends, and released a song dedicated to badgers, "Badger Swagger". Prior to the 2015 general election, it was reported that May was considering standing as an independent Member of Parliament. It was also revealed that May had started a "Common Decency" project "to re-establish common decency in our lives, work and Parliament". May said he wanted to "get rid of the current government" and wished to see a House of Commons containing "individuals voting according to their conscience". May was one of several celebrities who endorsed the parliamentary candidacy of the Green Party's Caroline Lucas at the election. He also endorsed a Conservative Party candidate, Henry Smith, on the grounds of his animal welfare record. In July 2015, May criticised UK prime minister David Cameron for giving Members of Parliament a free vote on amending the ban on fox hunting in England and Wales. During a live television interview, he also attacked the pro-hunting organisation the Countryside Alliance as "a bunch of lying bastards" for their support for a change to the law. The vote was postponed by the government following the intervention of the Scottish National Party's Westminster MPs, who committed to vote to keep the ban as it existed. May told anti-hunt protesters in a rally outside Parliament that it was "a very, very important day for our democracy" but added "we have not yet won the war, there's no room for complacency". In 2016, May expressed opposition to the UK leaving the European Union (Brexit), referring to it as "the stupidest thing we ever tried to do". In June 2017, May endorsed Labour Party leader Jeremy Corbyn in the 2017 general election. May shared an article on Twitter by The Independent headlined "Jeremy Corbyn says Fox hunting is 'barbarity' and pledges to keep it banned" and captioned it: "Well, I guess that just about clinches it !! Anyone see any good reason not to prefer the evidently decent Corbyn over the weak and wobbly Mrs May? Bri". May has had a lifelong interest in collecting Victorian stereophotography. In 2009, with co-author Elena Vidal, he published his second book, A Village Lost and Found, on the work of English stereophotography innovator T. R. Williams. He was awarded The Royal Photographic Society's Saxby Medal in 2012 for achievement in the field of three-dimensional imaging. May made a significant technical contribution to the book to accompany the exhibition 'Stereoscopic Photographs of Pablo Picasso by Robert Mouzillat', held at the Holburne Museum in Bath, England from February to June 2014. The book provides a cross-section of photographs of Picasso in his studio, at the bullfight at Arles and in his garden. May's 3D 'Owl viewer' is used to view the photographs in 3D. The purchase of his first card in 1973 started May on a lifelong and worldwide search for Les Diableries, which are stereoscopic photographs depicting scenes of daily life in Hell. On 10 October 2013 the book Diableries: Stereoscopic Adventures in Hell by Brian May, Denis Pellerin and Paula Fleming was published. In 2017, May published Queen in 3-D, chronicling the group's 50-year history. It contains over 300 of his own stereoscopic photos and is the first book about the band published by one of its members. Included with the book is May's patented OWL Stereoscopic Viewer. As part of May's role as a collaborator with the NASA's science team on the New Horizons mission, he worked on the first stereoanaglyph based on images of Ultima Thule that were captured by the spacecraft. In the 2018 biographical film Bohemian Rhapsody, May was portrayed by Gwilym Lee. May served as a creative and musical consultant for the film. 1 2 May, Brian; Bradley, Simon (2014). Brian May's Red Special. Prion Books. ISBN 978-1-78097-276-3. ↑ "BBC News: Planet Rock Radio poll". 10 July 2005. Archived from the original on 21 October 2007. Retrieved 28 January 2008. 1 2 "100 Greatest Guitarists Of All Time: Brian May". Rolling Stone. Retrieved 27 September 2014. ↑ "Readers Poll Results: The 100 Greatest Guitarists of All Time". Guitarworld.com. Retrieved 22 July 2015. ↑ "Queen, Tina Turner to Receive Grammy Lifetime Achievement Award". Rolling Stone. Retrieved 2018-06-30. ↑ "Queen star May hails Muse album". News.bbc.co.uk. Archived from the original on 13 July 2012. Retrieved 27 September 2014. ↑ "May installed as uni chancellor". BBC. 14 April 2008. Archived from the original on 18 October 2009. Retrieved 23 October 2009. ↑ Danthropology (30 July 2015). "Queen's Brian May is a member of NASA's New Horizon team". Patheos.com. Retrieved 6 April 2018. ↑ "Smithsonian.com - Smithsonian Magazine". Smithsonianmag.com. Retrieved 6 April 2018. ↑ "European Space Agency to join Brian May's Asteroid Day". BBC. 9 February 2016. Retrieved 9 February 2016. 1 2 May, Brian (12 July 2010). "Kill the cull, not the badgers". The Guardian. London. 1 2 3 4 Huntman, Ruth (17 October 2014). "Brian May: Me, my dad and 'the old lady'". The Guardian. Retrieved 25 October 2014. ↑ "I'm Exactly Half English and Half Scot..." Brian's Soapbox. 13 September 2014. ↑ Hodkinson, Mark (1995). Queen: The Early Years. Omnibus Press. p. 40. ISBN 978-1-84449-012-7. 1 2 "The dude in the cardigan with the guitar". Retrieved 27 July 2008. ↑ "List of lists: Celebrities and remarkable people". Telegraph.co.uk. 22 May 2008. Retrieved 27 September 2014. 1 2 "Queen star hands in science PhD". BBC News. 3 August 2007. Archived from the original on 25 March 2008. Retrieved 3 August 2007. ↑ "Tim Staffell Biography". 30 September 2011. Archived from the original on 30 September 2011. Retrieved 6 April 2018. ↑ "The 10 best Queen songs Freddie Mercury didn't sing". Louder. Retrieved 19 November 2018. ↑ "Top 10 Brian May Queen songs". Ultimate Classic Rock. Retrieved 19 November 2018. ↑ "Queen – One Vision". AllMusic. Retrieved 27 September 2014. ↑ Prato, Greg. "Innuendo overview". Retrieved 19 November 2018. ↑ "Readers' Poll: 10 Greatest Queen Songs". Rolling Stone. Retrieved 19 November 2018. ↑ "2008 The Cosmos Rocks Tour". Ultimatequeen.co.uk. Retrieved 27 September 2014. ↑ "Paul Rodgers, Queen Split: "It Was Never a Permanent Arrangement"". Rollingstone.com. Retrieved 6 April 2018. ↑ Sean Michaels (21 February 2012). "Queen's show goes on as Adam Lambert replaces Freddie Mercury". The Guardian. ↑ "BBC - Queen and Adam Lambert to perform New Year's Eve concert broadcast on BBC One - Media Centre". BBC.co.uk. Retrieved 28 February 2018. ↑ "Anita Dobson and Brian May surprise wedding". Hello!, 5 December 2000, republished at "Brian May and Anita Dobson Wedding Reports". BRIANMAY.com. Retrieved 22 May 2010. ↑ "Back to the Light - Brian May | Songs, Reviews, Credits | AllMusic". AllMusic. Retrieved 28 February 2018. ↑ Horne, Nicky. "Queen – Royal Legend: Interviews: Brian May: Talk Radio '98". Queen.musichall.cz. Retrieved 24 October 2011. ↑ Lemieux, Patrick (2018). The Queen Chronology (2nd Edition). Lulu. p. 137. ↑ "1993 Back To The Light North American Tour (1st leg)". Ultimatequeen.co.uk. Retrieved 27 September 2014. ↑ "Made in Heaven". Queenonline.com. Retrieved 27 September 2014. ↑ White, Adam (19 July 2017). "From badgers to flamboyant alter egos: a guide to the strange obsessions of Queen's Brian May". The Daily Telegraph. ↑ Anthony, James (November 7, 2008). "Brian May dropped from Guns N' Roses album". The Guardian. ↑ "A Night at the Opera, 30th Anniversary CD/DVD". AllMusic. Retrieved 28 September 2014. ↑ "Billboard Albums: Spider-Man 2". Allmusic. Retrieved 27 September 2016. ↑ "No. 57665". The London Gazette (Supplement). 11 June 2005. p. 8. ↑ Negrin, David. "A Conversation With Michael Hobson From The Music.Com". World of Genesis. Retrieved 29 July 2015. ↑ Fitzpatrick, Rob. "'I'm The Antichrist of Music' Immensely popular for decades, yet a permanent resident on music's outermost fringes of fashionability, Phil Collins would like to apologise. Are you ready to forgive?". FHM. April 2011. 1 2 May, Brian; Vidal, Elena. A Village Lost and Found (book with stereoscopic viewer). Frances Lincoln. ISBN 978-0-7112-3039-2. ↑ Brian May (1 April 2004). "New light on T.R. Williams: "Our Village" found at last!". Stereoworld magazine. Retrieved 23 May 2018. ↑ Kaufman, Gil (20 May 2009). "Kris Allen, Adam Lambert Tear Up Queen's 'We Are The Champions'". MTV. Retrieved 26 April 2012. 1 2 "SAVE ME 2010 | Home – Welcome". Save-me.org.uk. Duck Productions. Retrieved 24 October 2011. ↑ "2011 Brian May Concertography: Kerry Ellis 'Anthems' Tour". Ultimatequeen.co.uk. Retrieved 27 September 2014. ↑ Corner, Lewis (22 July 2011). "Lady Gaga Confirms new single to be Yoü and I:". Digital Spy. Retrieved 19 November 2018. ↑ Dinh, James (May 5, 2011). "Lady Gaga Bends Gender, Minds With VMA Monologue". MTV (MTV Networks). Retrieved May 9, 2011. ↑ "Sonic Universe featuring Brian May on 25th April". The Official Queen Website (Press release). ↑ "My Chemical Romance joined by Queen's Brian May at Reading Festival". NME.COM. 26 August 2011. Retrieved 27 September 2014. ↑ "The Darkness Wow The 100 Club At Intimate Show". JustinHawkinsRocks.co.uk. 11 October 2011. ↑ "The Darkness @ 100 Club 10th October 2011". Planet Music Reviews. 13 October 2011. ↑ "Queen Guitarist Brian May Joins The Darkness On Stage". Ultimate Classic Rock. 26 December 2011. ↑ "QUEEN's BRIAN MAY Performs With THE DARKNESS In London". Blabber Mouth. 26 December 2011. 1 2 "Katy and Adam Honour Queen". MTV AUSTRALIA. Retrieved 27 September 2014. 1 2 "Adam Lambert to perform with Queen at Sonisphere". BBC News. Retrieved 27 September 2014. ↑ "Press Release: Queen To Play Hammersmith". 12 April 2012. Retrieved 12 April 2012. ↑ "Queen + Adam Lambert Playing Four Shows This Summer". Billboard. 9 April 2012. Retrieved 27 September 2014. ↑ "Queen + Adam Lambert Hammersmith Shows – SOLD OUT". 19 April 2012. Retrieved 19 April 2012. ↑ "After 'Instant' Sell-out, Queen and Adam Lambert Add Third London Dat…". Archive.today. 8 July 2012. Archived from the original on 8 July 2012. Retrieved 6 April 2018. ↑ "Queen Rock Kiev With Adam Lambert". Ultimate Classic Rock. Retrieved 27 September 2014. ↑ "Press Release: Queen + Adam Lambert Will Rock Moscow". 28 February 2012. Retrieved 6 July 2012. ↑ "Adam Lambert has second show with Queen". USATODAY.COM. Retrieved 27 September 2014. ↑ "Press Release: Queen + Adam Lambert Announce Poland Show". 27 April 2012. Retrieved 6 July 2012. ↑ "Dappy says his hook-up with Queen's Brian May 'pays tribute to Amy Winehouse and 27 club'". NME. 18 January 2012. ↑ "Dappy ft. Brian May: 'Rockstar' – Single review". Digital Spy. 16 February 2012. ↑ "Dappy & Brian May perform We Will Rock You in the Live Lounge". BBC. 27 February 2012. 1 2 "Olympics Closing Ceremony: Jessie J Joins Queen For 'We Will Rock You' Performance". Capital. 12 August 2012. Retrieved 27 September 2014. ↑ "Olympics closing ceremony – playlist". Telegraph.co.uk. 12 August 2012. Retrieved 27 September 2014. ↑ "Led Zeppelin, Iron Maiden and Queen band members perform at charity rock show". NME.COM. 17 September 2012. Retrieved 27 September 2014. ↑ Tribbey, Ralph (19 March 2016). "DVD & Blu-Ray Release Report: Filmmaker Gorman Bechard's A Dog Named Gucci To Make Its DVD Debut On Apr. 19". DVD & Blu-Ray Release Report. Retrieved 12 April 2016. ↑ "Queen News March 2006". brianmay.com. 1 2 "Queen + Paul Rodgers Concertography". Ultimatequeen.co.uk. Retrieved 27 September 2014. ↑ "Queen & Foo Fighters "We Will Rock You/We Are The Champions" Live at Rock Honors 2006". vh1.com. Retrieved 27 September 2014. ↑ May, Brian (15 August 2006). "USA Convention Story and Queen and Paul Rodgers Heading Towards a Studio Assignation". Archived from the original on 24 May 2012. Retrieved 19 December 2009. 1 2 "Queen & Paul Rodgers – Live In Ukraine DVDs!". Dailyrecord.co.uk. Retrieved 27 September 2014. ↑ "Paul Rodgers, Queen Split: "It Was Never a Permanent Arrangement"". idiomag. 13 May 2009. Archived from the original on 29 May 2009. Retrieved 14 May 2009. ↑ "Queen and Paul Rodgers split". idiomag. 14 May 2009. Archived from the original on 29 May 2009. Retrieved 14 May 2009. ↑ "Lineup announced for the 2013 iHeartRadio festival". Cbsnews.com. 15 July 2013. Retrieved 27 September 2014. ↑ "Adam Lambert to join Queen for North American Tour". ABC News. Retrieved 16 June 2015. ↑ "Queen and Adam Lambert's Tour Opener: 5 Things We Learned". Rolling Stone. Retrieved 16 June 2015. ↑ "Queen and Adam Lambert Announce 2014 Australian Tour". Aria Charts. Retrieved 16 June 2015. ↑ "Queen with Lambert announce NZ show". Stuff.co.nz. Retrieved 16 June 2015. ↑ "Press Release: Queen + Adam Lambert To Play Korea at Super Sonic 2014". QueenOnline. Retrieved 16 June 2015. ↑ "Press Release: Queen + Adam Lambert Confirm Summer Sonic 2014 in Japan". Retrieved 16 June 2015. ↑ "Queen + Adam Lambert European Tour: Now On General Sale / New London Date Added!". QueenOnline. Retrieved 16 June 2015. ↑ "Queen + Adam Lambert to Rock in Rio – Tickets Now On General Sale". QueenOnline. Retrieved 16 June 2015. ↑ "Isle of Wight Festival: Queen pay tribute to Orlando shooting victims". BBC. 14 June 2016. ↑ "After Four Decades, Queen Rock Israel with Help From Adam Lambert". Billboard. 16 September 2016. ↑ ""Queen + Adam Lambert announces Las Vegas residency"". KTNV. 7 May 2018. ↑ "BRIAN MAY: QUEEN Is Not Working On New Music With Singer ADAM LAMBERT". BlabberMouth.net. Retrieved 16 June 2015. ↑ "Queen". Encyclopædia Britannica. 2007. ↑ Sharpe-Young, Garry. Brian May. Rockdetector. Archived from the original on 4 September 2015. ↑ Coleman, Mark (9 October 1986). "A Kind of Magic". Rolling Stone (484). Archived from the original on 1 October 2007. ↑ Donaghy, James (17 February 2007). "Not another axe to grind". The Guardian. London. Archived from the original on 4 March 2007. Retrieved 26 April 2010. 1 2 May, Brian (2004). "the may-keeters homepage". brianmayworld.com. Retrieved 2 December 2008. ↑ "Steve Vai Interview". Queenonline.com. Retrieved 27 September 2014. ↑ "Two's Company: The Duets". AllMusic. Retrieved 27 September 2014. ↑ Prato, Greg (18 July 2012). "Brian May at Allmusic". Allmusic.com. Retrieved 18 July 2012. ↑ "The Life of Brian in Guitar World". Intellectualonly-mercury.ru. Archived from the original on 10 August 2011. Retrieved 29 August 2011. ↑ "Whole lotta riffs". Guitarist. Issue 247. March 2004. ↑ "Steve Hackett". Inside Out Music. 2015. Retrieved 23 August 2015. ↑ "Interview with Steve Hackett". dmme.net. January 2001. Retrieved 23 August 2015. 1 2 "The 'Spade' guitar". Guyton Guitars. Retrieved 6 April 2018. ↑ David McNamee. "Hey, what's that sound: Homemade guitars". the Guardian. Retrieved 27 September 2014. ↑ "Songwriters Hall of Fame – Brian May Biography". Songwritershalloffame.org. Archived from the original on 25 October 2014. Retrieved 27 September 2014. ↑ "Guitar Builder (Luthier) in East Anglia, UK – High Quality Hand Made Custom Electric Guitars by Andrew Guyton". Guytonguitars.com. Archived from the original on 3 February 2014. Retrieved 15 July 2014. ↑ Simon Bradley. "Brian May's Guyton Double Neck". Musicradar.com. Retrieved 27 September 2014. ↑ "Vox AC30 Brian May". Brianmaycentral.net. Archived from the original on 29 October 2014. Retrieved 27 September 2014. ↑ "The Legendary Deacy Amp". queenwillrockyou.weebly.com. ↑ Billboard 21 Jun 1997. Books.google.com. Retrieved 27 September 2014. ↑ "50 Greatest Guitar Solos". Guitarworld.com. Retrieved 27 September 2014. ↑ The Making of 'Bohemian Rhapsody' on YouTube, Retrieved 28 December 2012. ↑ Hicks, Tom R.; May, Brian H.; Reay, N. Ken (1972). "MgI Emission in the Night Sky Spectrum". Nature. 240 (5381): 401–402. Bibcode:1972Natur.240..401H. doi:10.1038/240401a0. ISSN 0028-0836. ↑ Hicks, T. R.; May, B. H.; Reay, N. K.; Ring, J. (1974). "An Investigation of the Motion of Zodiacal Dust Particles--I: Radial Velocity Measurements on Fraunhofer Line Profiles". Monthly Notices of the Royal Astronomical Society. 166 (2): 439–448. Bibcode:1974MNRAS.166..439H. doi:10.1093/mnras/166.2.439. ISSN 0035-8711. ↑ Never Mind The Buzzcocks. Series 21. Episode 10. 25 minutes in. BBC. ↑ "BRIAN MAY – Official Biography". Brianmay.com. Archived from the original on 25 May 2012. Retrieved 24 October 2011. ↑ May, Brian. "News". Archived from the original on 20 July 2012. ↑ "Queen star celebrates doctorate". BBC News. 23 August 2007. Retrieved 25 August 2007. ↑ "Imperial College Graduation". Imperial College London. 23 May 2018. ↑ May, Brian; Moore, Patrick; Lintott, Chris (2006). Bang! The Complete History of the Universe. Carlton. ISBN 1-84442-552-5. ↑ "Queen star hands in science PhD". BBC News. 9 March 2007. Retrieved 2 January 2010. ↑ May, Brian; Moore, Patrick; Lintott, Chris (2012). The Cosmic Tourist. Carlton. ISBN 978-1-84732-619-5. 1 2 Anthony, Andrew (13 March 2011). "Wonders of the Universe; The Sky at Night". The Guardian. London. Retrieved 23 May 2012. ↑ "New Chancellor confirmed". Ljmu.ac.uk. Liverpool John Moores University. 23 November 2007. Archived from the original on 6 September 2010. Retrieved 24 October 2011. ↑ "May installed as uni chancellor". BBC News. 14 April 2008. Archived from the original on 15 April 2008. Retrieved 14 April 2008. ↑ NASA. "JPL Small-Body Database Browser". Retrieved 19 July 2010. ↑ Dr. Stuart Clark. "Brian May: Asteroid Day can help protect the planet". The Guardian. Retrieved 3 December 2014. ↑ "Starmus 3 full schedule announced". CS.Astonomy.com. Retrieved 6 January 2019. ↑ NASA (17 July 2015). "NASA News Conference on the New Horizons Mission". YouTube.com. Retrieved 6 April 2018. ↑ Talbert, Tricia (21 July 2015). "Rock Star/Astrophysicist Dr. Brian May Backstage With New Horizons". Nasa.gov. Retrieved 6 April 2018. ↑ Kaplan, Sarah. "NASA's New Horizons spacecraft just visited the farthest object ever explored". Washington Post. Retrieved 1 January 2019. ↑ May, Brian. "News December 2005". Archived from the original on 4 May 2006. Retrieved 14 August 2007. ↑ "The Legendary Rock Star at home in Surrey, 19 June 1998". Brianmay.com. 19 June 1998. Retrieved 24 October 2011. ↑ Trendell, Andrew (4 May 2017). "Sunday Times Rich List 2017 reveals UK's top 20 wealthiest names in music". NME. Retrieved 8 July 2017. ↑ Cooke, Rachel (5 September 2010). "Brian May: The Interview". The Guardian. London. Retrieved 8 October 2010. ↑ May, Brian (6 February 2006). "SMOKING: WE DO NOT HAVE TO WAIT !!". Brian's Soapbox Feb 06. Archived from the original on 8 April 2008. Retrieved 27 July 2008. ↑ "Queen wants Moscow sports complex to become non-smoking area". Queen News June 2008. Regnum News Agency. 19 June 2008. Retrieved 27 July 2008. ↑ "Brian May named vice-president of RSPCA". Farmers Weekly. Retrieved 27 September 2014. ↑ RT. "Brian May to RT: I still feel Freddie's around". YouTube. Retrieved 11 May 2017. ↑ Neal, Charlotte (13 August 2015). "Brian May: 'Case for development is weak and motivated by money'". getsurrey. Retrieved 8 January 2018. ↑ "Queen's Brian May plants first tree in Dorset woodland". Bournemouth Echo. Retrieved 8 January 2018. ↑ "Brian May unveils woodland vision". BBC News. 12 February 2013. Retrieved 8 January 2018. ↑ Lencioni, F.A.A. (9 July 2013). "Diagnoses and discussion of the group 1 and 2 Brazilian species of Heteragrion, with descriptions of four new species (Odonata: Megapodagrionidae). Zootaxa 3685 (1): 001–080" (PDF). Zootaxa. Magnolia Press – Auckland, New Zealand. Retrieved 26 September 2015. ↑ "Brian May on saving the fox". BBC News. 9 June 2010. ↑ HARDtalk "clip of May's interview" on YouTube, BBC, 22 September 2010. ↑ "Bow Group urges the Government to Scrap Badger Cull plans". Bow Publishing. 25 March 2012. Archived from the original on 28 April 2012. Retrieved 8 May 2012. ↑ Barkham, Patrick (26 March 2012). "Badger Cull divides Tories". The Guardian. London. Retrieved 8 May 2012. ↑ "Now even Tories are calling for the badger cull to be scrapped". Western Morning News. 3 April 2012. Retrieved 8 May 2012. ↑ "Brian News – April 2013". Brianmay.com. Retrieved 15 July 2014. ↑ "About TeamBadger". Teambadger.org.uk. Archived from the original on 29 June 2014. Retrieved 15 July 2014. ↑ "Brian May's 'Save the Badger Badger Badger' song climbs iTunes chart". Digital Spy. Retrieved 2 September 2013. ↑ "Badger protest song by Brian May reaches charts". The Guardian. Retrieved 2 September 2013. ↑ "Slash and David Attenborough join Brian May in pro-badger supergroup". The Guardian. 4 June 2013. Retrieved 16 June 2013. ↑ Selby, Jenn (4 February 2015). "Brian May 'could stand an Independent MP': Queen guitarist's spokesperson drops tenuous hints about political intentions". The Independent. Retrieved 18 July 2015. ↑ Elgot, Jessica (24 April 2015). "Celebrities sign statement of support for Caroline Lucas – but not the Greens". The Guardian. London. Retrieved 22 July 2015. ↑ "Queen legend Brian May urges Crawley residents to vote Conservative at General Election". Crawley News. 27 March 2015. Retrieved 22 July 2015. ↑ Dathan, Matt (10 July 2015). "'A bunch of lying b*****ds' – Brian May and Paul McCartney hit out at David Cameron's 'cruel and unnecessary' bid to bring back fox hunting". The Independent. Retrieved 12 July 2015. ↑ Beamen, Emily (14 July 2015). "Brian May hails 'important day for democracy' after vote on foxhunting ban is postponed". The Independent. Retrieved 18 July 2015. ↑ "Brian May: 'Brexit is the stupidest thing we ever tried to do'". Retrieved 18 December 2018. ↑ Oppenheim, Maya (8 June 2017). "Election 2017: The surprising and not-so surprising ways celebrities will be casting their ballots today". The Independent. Retrieved 14 June 2017. ↑ Milne, Oliver (8 June 2017). "Who are celebrities voting for in 2017 General Election? The A-Z of famous names supporting Labour, the Tories, the Lib Dems and Greens". Daily Mirror. Retrieved 14 June 2017. ↑ Kennedy, Randy (25 July 2010). "A Village Preserved, Green and All: Brian May's Photographic Recovery". The New York Times. ↑ "Royal Photographic Society's Saxby Award Accessed 29 October 2012". Rps.org. Archived from the original on 31 December 2013. Retrieved 27 September 2014. ↑ "Brian May's Visions Of Hell". MOJO. Retrieved 27 September 2014. ↑ "Retrieved 8 March 2014". Londonstereo.com. Retrieved 27 September 2014. ↑ "Brian May: there's life in the old devil yet". Telegraph.co.uk. 25 October 2013. Retrieved 27 September 2014. ↑ Kreps, Daniel (12 July 2017). "Brian May Unveils Queen History in Expansive 3-D Photo Book". Rollingstone.com. Retrieved 1 July 2018. ↑ "NASA New Horizons, Ultima Thule: press briefing on the results from the flyby". Rollingstone.com. CBS News. 3 January 2019. Retrieved 4 January 2019. ↑ Queen Pic ‘Bohemian Rhapsody’ Finds Bandmates In Ben Hardy, Gwilym Lee & Joe Mazzello, Retrieved August 22, 2017. ↑ "Brian May says Rami Malek deserves Oscar nomination for turn as Freddie Mercury". The Telegraph. Retrieved 14 January 2018. "Save the Badger Badger Badger"
"New Horizons (Ultima Thule Mix)"